It’s April 1990. By month’s end the Hubble Space Telescope will be in orbit, 126 people will die in an earthquake in China, and wrecking cranes will begin disassembling the Berlin Wall. In the world of hip-hop, Ice Cube has departed from the seminal group N.W.A. and will release his critically acclaimed debut Amerikkka’s Most Wanted. Public Enemy released Fear of a Black Planet, which will hit Billboard’s charts at Number 10. Gang Starr will release Step Into the Arena, which is regarded by some to be greatest rap album of all time. Rap has long since proven that it’s not a fad. Increasingly, it’s tone and lyrics have turned to social injustice both in the inner cities and abroad. Artists genuinely carry the burden of their roots, but they also trade on it as they project an image that will frequently be adopted in the suburbs. It is into this environment that an especially colorful and experimental album will enter and turn the world on it’s head. I can recall clearly my first interaction with A Tribe Called Quest’s music. I was watching BET’s Rap City, hosted by “Mayor” Chris Thomas. At the time, MTV’s Yo MTV Raps and Rap City were the principle outlets for new music and video content when you were a kid living in the suburbs of Orlando. The video starts out with a series of stick figures introducing the group’s logo. We then hear a some flamenco guitar as the camera races towards a little person wearing a sombrero in the middle of the road. An infectious beat kicks in. We then see those same figures dancing in interesting and colorful ways that are seriously reminiscent of a Keith Haring’s work. The video gets progressively stranger as the hook comes in an infects your brain. We then cut to a tight shot of the group’s leader, Q-Tip who is reporting to a group of officers that he has lost his wallet. While it’s easy to describe the video, what’s sincerely challenging to communicate is exactly how different this was from nearly anything else we had seen to date. This predates the Internet. Unless you read rap magazines or could see these artists live, you had no idea what hip-hop fashion was at the time. Only the sonic boom level movements really had the energy to exceed the borders of New York and make it across the country. Many were still reeling from the release of what would become Public Enemy’s most famous song “Fight The Power”. It was just becoming the anthem that it’s still known as today. A Tribe Called Quest debuted with an album full of lyrical whimsy and masterful production. Taken at it’s release, it received a tepid critical response as being “too loose”, “too whimsical” or too “danceable”. It turned out to be exactly what the people of the time needed and wanted. There was some sense of optimism in the air and it was time to take a step back and actually enjoy the lives we were living with out the monkey of the Cold War on our backs. As a huge fan of this group and album every track on the album is important to me. Just yesterday, the 25th Anniversary remaster was released which featured some new remixes and a big boost in acoustic quality. Since I can’t just mention one song, I’m going to quickly work through the track listing and offer a couple of observations from each. “Push It Along” – THAT BABY CRYING! I was really confused when I originally got this album. I just didn’t understand what was going on. When beat drops, there’s a super short stab from the guitar and then we realize our lives have just changed for the better. “After Hours” – Such a great jam. I have great memories of those frogs at the end of the song. No rap album I’d ever heard had dared to risk street cred to put frogs into their song. Also: THAT BEAT! “Footprints” – Again another incredible beat! “This ain’t rock-n-roll cause the rap is in control!” In the re-issue, Cee Lo Green tackles this song and finds a much more jazzy approach that carries a lounge feel. In the last minute or so, Green drops his own inspirational verse. I liked, but did not love the remix. “I Left My Wallet in El Segundo” – Already covered this one. I will add that I had a copy of the cassette single promo of this song, which included a velcro wallet. No joke. Don’t know what happened to it. I’ve never seen another. “Pubic Enemy” – In addition to featuring DJ Red Alert, it’s a rap song about VD! Both educational and hilarious! “Bonita Applebaum” – For some reason, it took me a while to warm to this song, even though it’s partially responsible for this album’s enduring success. Love it now. I hear it completely differently now. Pharrell Williams find a new level of funk in his re-issue remix breathing new life into this classic track. “Can I Kick It?” – This is the most remembered song from Tribe. The Lou Reed sample is a naturally familiar and tonally appropriate addition to this hit. When I listen to it, I cannot shake the amazing sound of the snare drum. Next time you listen, hear how that crack makes it’s way through the rest of what ends as a sonically dense and very danceable jam. J. Cole yanked the memorable hook from this song to generate an ethereal atmosphere in his re-issue remix. “Youthful Expressions” – The baseline is just so damned groovy. “Rhythm (Devoted to the Art of Moving Butts)” – This song starts out with an “It’s a new decade!” They couldn’t be more right. “I got the rhythm, you got the rhythm” comes through in whispers. The beat/bass combination in this song is one of the top three on the album. Ham ‘N’ Eggs – Perhaps the heights of whimsy. Outside of the Sugar Hill Gang, who has rhymes about their diet? The Tribe eats the occasional steak? Who are these guys??? “Description of a Fool” – I love the beat on this song, but to be honest, it’s my least favorite in an album of favorites. History went on to show ATCQ’s long lasting influence on hip-hop and pop music. I have to say that I’m seriously looking for and forward to additional re-issues from the group. 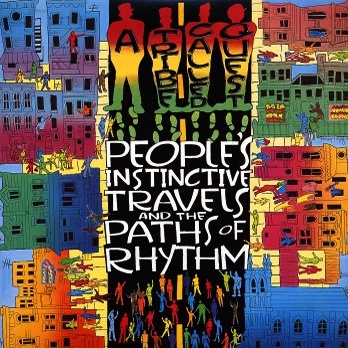 Whether that comes to pass, People’s Instinctive Travels and the Path of Rhythm is one of my favorite albums of all time and it’s nice to be reunited with an old friend. I’ve been thinking about getting the blog moving again recently. I’ve had quite a big stir in my life the last couple of years and it’s a good idea to get some thoughts out. This blog will capture book reviews, random acts of creativity, rants and any other share worthy posts that come to my mind. It is guaranteed to be random. So who am I today? I’m a parent of two amazing kids who are without their father for quite a long amount of time. I miss them dearly. I’m a bi-coastal entrepreneur who has recently taken up the hobbies of improvisation and podcasting. I presently take courses and perform as part of Endgames while in SF. I’m also the host or co-host of three podcasts, which I’m realizing is fantastic fun and a great way to get some creative ideas out into the ether. I’m a perpetual volunteer with various non profit groups. I love to give back whenever I can. I’m stronger today than I was yesterday. I’m moving in the right direction.